We all love beetlejuice. Im crafty and love making my niece and nephews costumes every year. This year she told me she wanted to be the assistant cut in half in the waiting room from the movie beetlejuice. 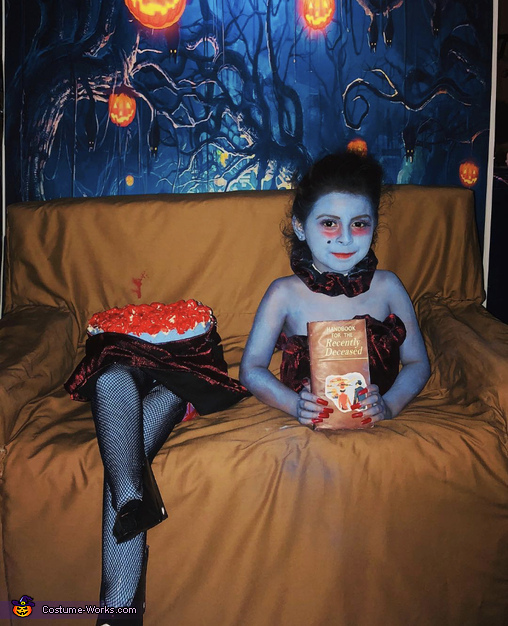 Shes 7 yrs old and for the past 5 yrs, ive made her costumes. Shes such a trooper and likes the attention. Family and friends look forward to her costume each yr. This was made from pretty much alot of cardboard and pvc pipes for the frame. I also used battling to make the couch feel soft and more real. Duct tape to take cardboard together. My mother helped with the sewing of the brown cover i got from walmart. I added 4 castor wheels so she can walk freely. Used 2 mannequin hands as her feet since i couldt find legs and the ones i found were too pricey. Made the shirt and skirt from some cool fabric my mother also sewed. Bought blue paint from a halloween store. The book i got from goodwill and i just printed the cover at a library. The handbook for the recently deceased.